Whew! I have been a busy bee these past couple weeks. You may not have seen a lot of me here, but I have been keeping busy with projects around the house. As you may recall, we bought our first house in the beginning of August. It feels like a lifetime ago, because we have been so busy with DIY projects, making it OUR home! 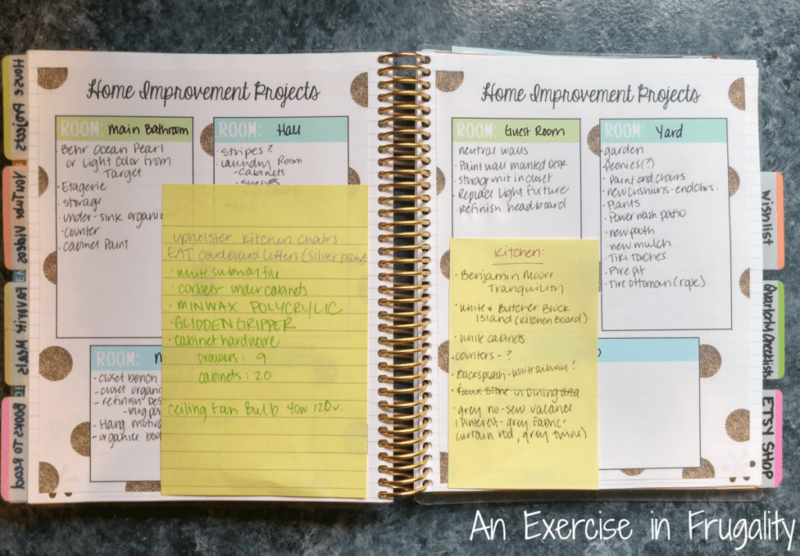 I keep all my household project ideas in my Erin Condren Life Planner. I love this thing, and I don’t know how I ever lived without it. (Shameless plug: these and other cute printables are available for purchase in my Etsy shop, Blush Rose Designs) As you can see, I’m going to be pretty busy for forever a while. PS: thanks to the realtor who sold us this house for the photo. None of this is my stuff! I completely forgot to take “before” photos prior to diving head first into this stuff, so we’ll resort to the listing agent’s photos. Whoops. I’ve listed on here all the things I have changed in this “mini-makeover”. Yes, the white stove will go bye-bye (eventually) and the white sink will be replaced too (someday when we have the money) but for right now, I focused on the things that would make the most impact for the least amount of money. Painting the walls was easy. Until I realized I forgot about the whole vaulted ceilings thing. I learned a lot of things throughout the course of these projects. One of the things I learned is that I have developed a fear of heights since my youth. 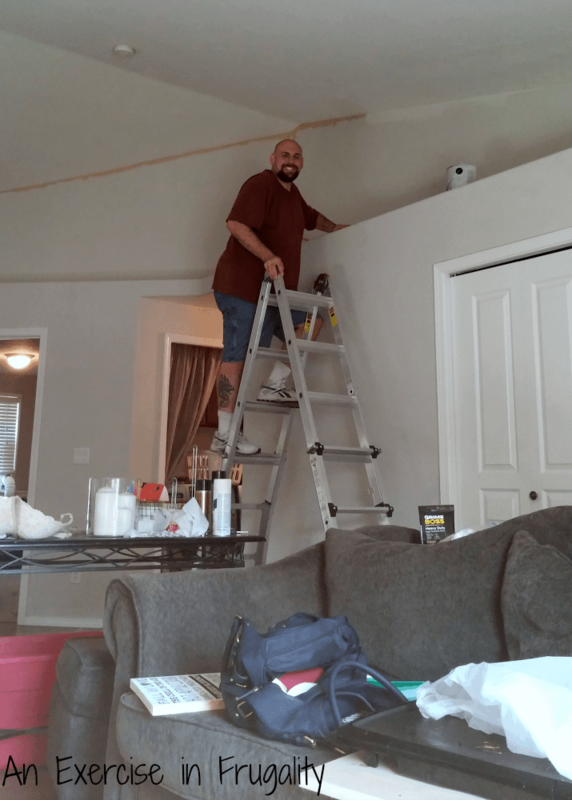 So I had my lovely assistant take over painting the high points of the kitchen/living area. Isn’t he a peach? It doesn’t look that high in this picture, but keep in mind that’s a 7 foot ladder with a 6 foot 2 inch man on top. Anyway, despite my newly onset paranoia of ladders and vaulted ceilings, the painting part of our DIY project was the easy part. I won’t be blogging about that (plenty of posts out there by people who know how to paint better than I do!) but I did want to share the other projects since they are more involved. With winter coming up, I figured now was a good time to share this, as lots of people do these kinds of crazy projects while you’re fending off cabin fever! The tile project only took a couple of days. I had some trouble with the tile cutting…I’ll get into that. Overall though, it seemed intimidating but once I got the hang of it, it was no big deal. I assure you every single one of you reading this is fully capable of tiling a backsplash. Except maybe you. Just kidding! So having little to no tile experience prior to this project, I did a little research about the materials and dove right in. Growing up, my father was always doing projects around the house and I, being the oldest (and despite being the only girl) was begrudgingly forced into manual labor from an early age. Fast forward a couple decades, and I am glad he made me help, because now I am not afraid of power tools. I’m certainly no expert, but I know my way around a workbench enough to do basic household projects! So ladies, don’t be afraid of that table saw. Teach your daughters how to use tools…you’ll save lots of money on handymen, and they will grow up to thank you! I ripped out the previous backsplash, which was basically just a flimsy piece of laminate that matched the countertops, with a gross strip of metal as a border. I simply peeled it off the wall, and made sure there were no big chunks of adhesive left behind before getting started. 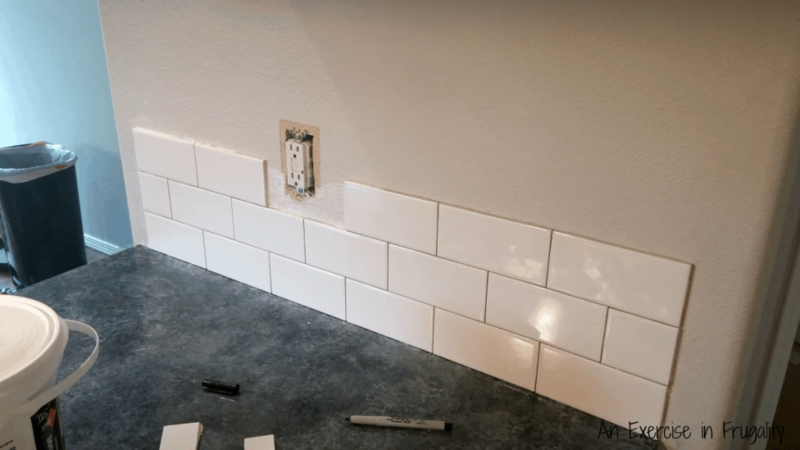 When you do subway tile, you want to stagger your rows. This means every-other-row will start with a half tile as you can see above. Those easy half cuts require a nice, clean edge, and so I used the tile cutter (sort of like a slide trimmer) for those cuts. They are super simple and break nice and clean, but you want to put the cut edge facing inward so your smooth tile edge is facing the outside. For the pesky cuts around the outlets, I used my Dremel with a diamond tile saw blade attachment and a lot of patience. It took forever, but it was the only way I could get the tiles cut. I tried scoring and using the nippers and I busted a couple dozen tiles before giving up. Dremel or a wet saw is the way to go. I did use the nippers for trimming off excess tile and cleaning up edges, so they definitely served their purpose. Use a grease pen, or another erasable marker to mark lines where you need your cuts to be. I used a Sharpie, thinking I would just cut off where the marks were, but to my surprise, Sharpies wipe right off of these tiles. You might want to test yours first rather than taking my word for it though since all tiles are different! Your cuts don’t have to be perfect around the outlets, because they will be covered up by your outlet switches. An important note: when you tile the outlets, remove the screw holding the outlet into the box. You’ll need to replace this with a screw about 1/2″ longer than what they come with. 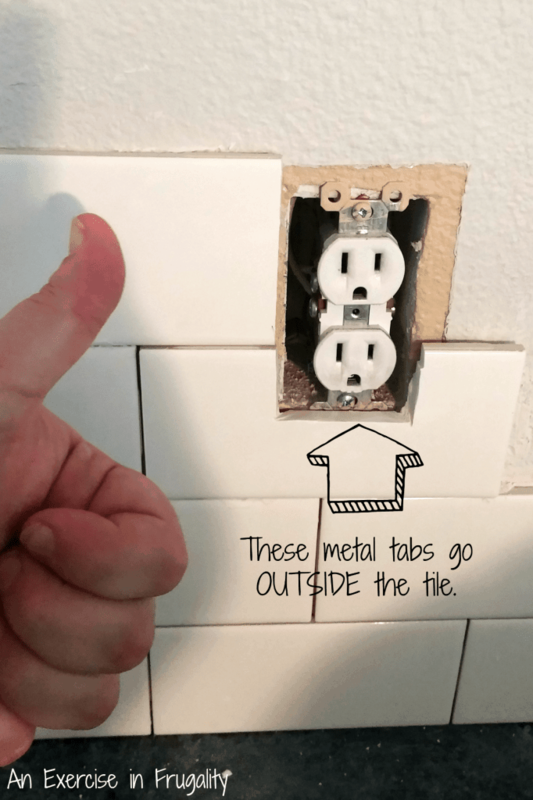 This way, you can rest the metal tabs against the tile, screw in the box, and then your outlet covers will sit nice and flush against the outside face of the tile, rather than having gaps or being sunken in to the wall. Alternatively, they sell spacers and extended boxes for these purposes, but you’re gonna have to ask someone else about those because I went this route! The tile took about two days to put on, because I had problems cutting it initially before I thought of the Dremel and tile blade. Once I got those, it was smooth sailing. Put on the tile adhesive as you’re ready to use it because it dries fast. Wipe up any excess immediately (or doom yourself to chiseling it off later). Lay your tiles in order, don’t try to jump around to different sections or your spacing could be off. Measure twice and cut once. I repeat. Measure. Twice. As much as it seems like a waste of time it isn’t. I got halfway down this wall before realizing my seams weren’t lining up correctly. Why? Because the half tile at the beginning of the row I was mentioning earlier….wasn’t a half tile, but rather a half-inch short, meaning all the lines were wrong. 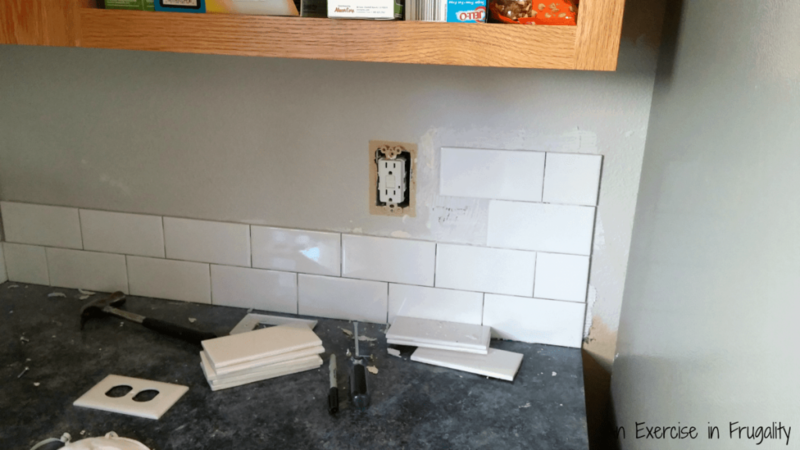 I had to not only rip off half the backsplash, but also re-cut all the outlets up to that point because now they were cut in the wrong place. HUGE waste of time. Do yourself and your sanity a favor. Measure twice. And then get someone to clean up after you’re done. Because that part is a paaaain. Speaking of wall color, the paint color in my kitchen and living room is Quill by Olympic. Its a light, clean gray and works perfectly for us! Very neutral and bright with a subtle warmth. It definitely makes the spaces feel larger than the weird yellowy beige the previous owners had, which I think was the original paint done when the house was built in 2004! Did you notice my pretty counters? Scroll back up to the “before” photos and you’ll see they are different now than they were! 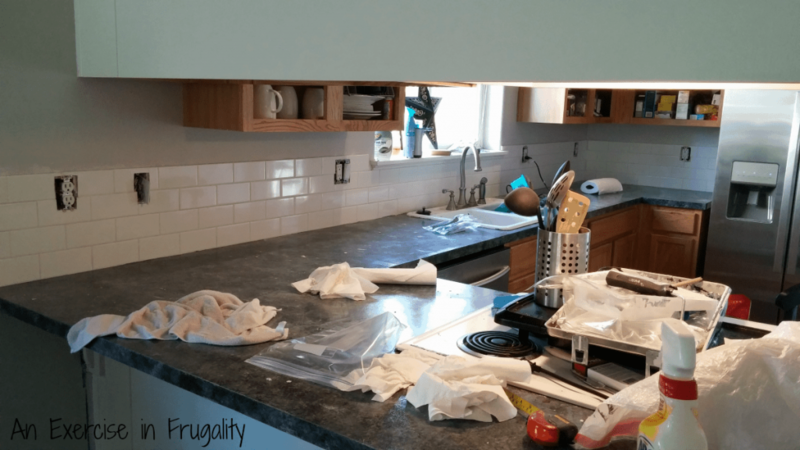 Find out how I did those in my DIY faux granite countertop paint post. You might be wondering where all my cabinet doors are. All of my cabinets are being painted. 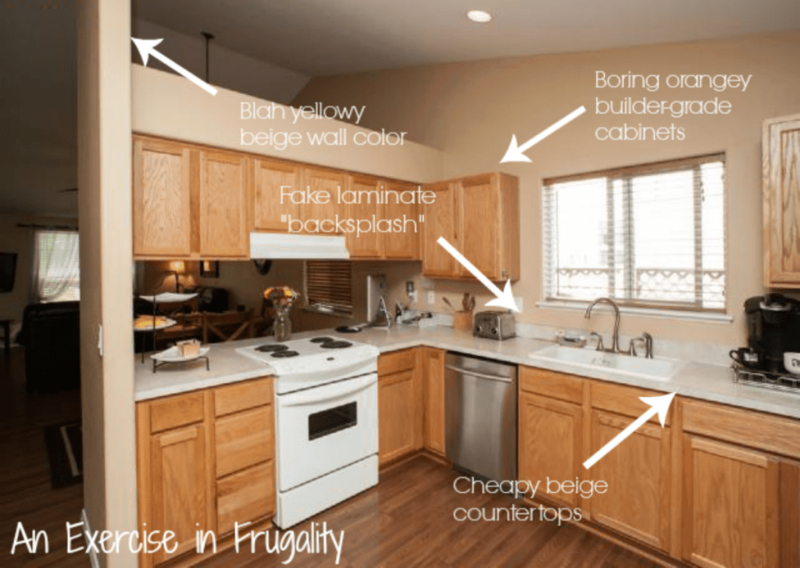 No more orange-y fake wood, builder-grade cabinets! We can’t afford to replace them, and they are in good shape, so they are getting a facelift, and possibly some hardware…so that’s another DIY post COMING SOON! If you’re curious about what color, there’s some hints if you look at all the pictures in this post! What do you think? 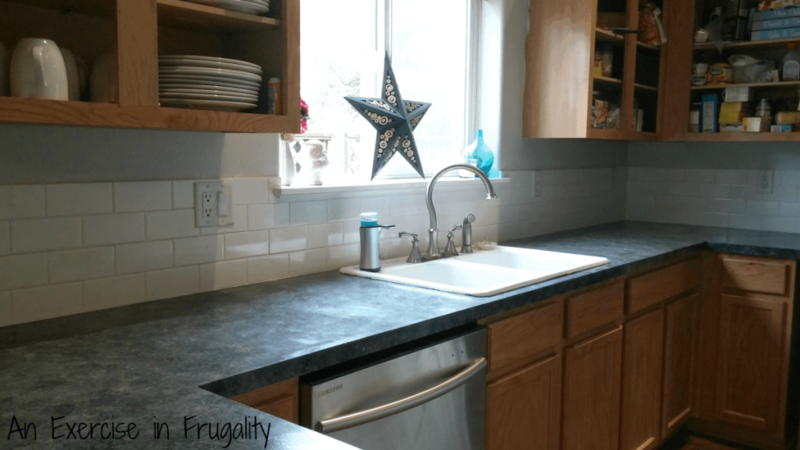 Have you ever made a tile backsplash? Don’t forget to check out the other posts in my kitchen makeover series! Hahaha! Thanks so much! 🙂 I definitely think I am going to do the bathroom too one of these days…I still have enough supplies left over…hmmm…. Bahaha! Thank you Susan. I think you’ll be able to do your backsplash just fine. The hardest part is cutting them, and for that you just need the right tools! The Dremel was a lifesaver but you have to have a diamond tile blade to cut the ceramic tile. Just wear safety goggles and gloves (and long sleeves because you do get little tiny pieces of red-hot ceramic that sometimes fly off and they don’t damage anything but they do sting when they fall on your skin! 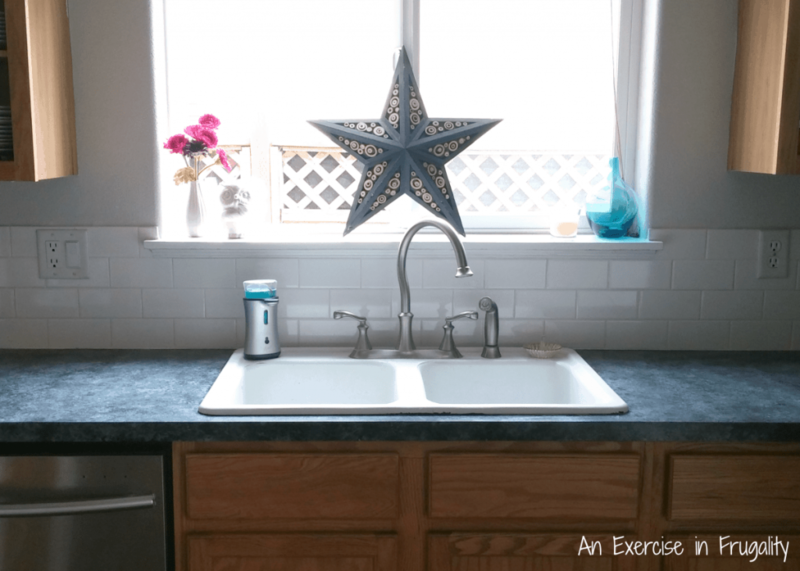 I have another post coming up soon about what I did for my countertops (hint: they are painted too! ).